If you don’t keep food covered, it dries out. Water the ground regularly to stop it from drying out. Usually when Dallas dips into a river on the hunt for lost treasures, he finds predictable items like sunglasses and jewelry. 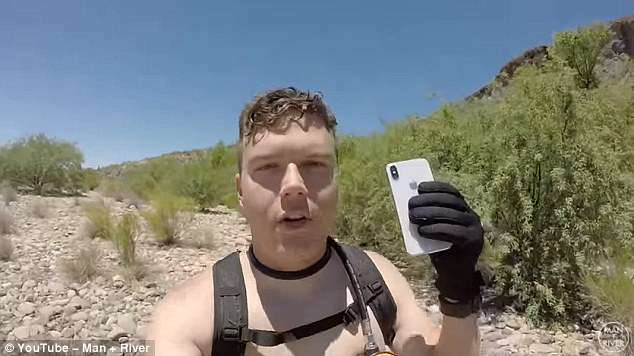 So the star of YouTube channel Man + River couldn’t help but get excited when he stumbled upon an iPhone X while exploring Arizona’s Salt River. But Dallas was even more shocked when he realized that the iPhone still worked – and made it his mission to return the phone to its owner. You cannot help but like her. 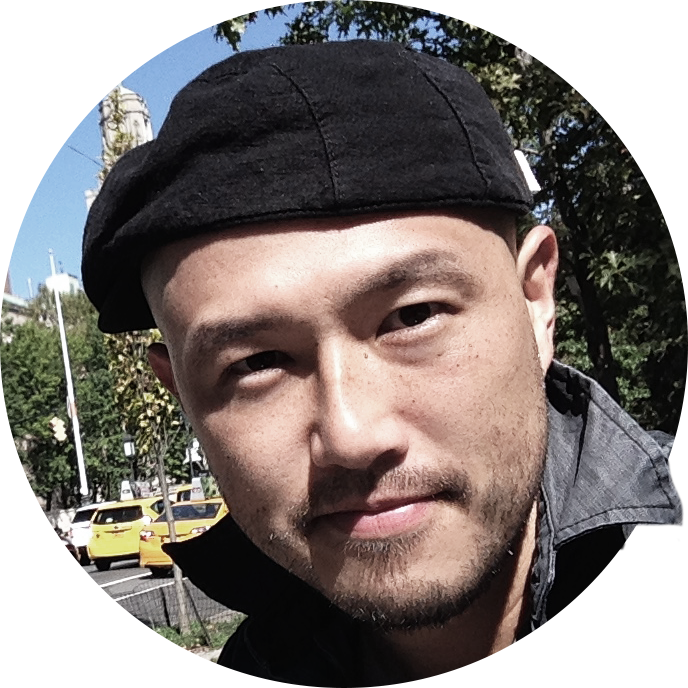 As I look back over my career, I cannot but smile. We stumbled across him in the library. A journalist finally stumbled on the truth. Look at what I stumbled across at the flea market! Since the iPhone was not in a waterproof case, Dallas let it dry out for three days, immersing it in a tub of silicone beads and even using a hair dryer. 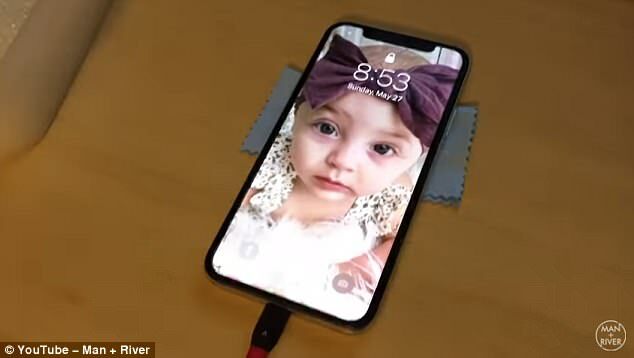 While the iPhone X is advertised as ‘splash, water, and dust resistant’ it is not waterproof and is not guaranteed – or covered under warranty – by Apple. But Dallas was in luck. When he put the phone on a charger, it began to light up. Dallas then took the phone’s SIM card and stuck it into his own phone so he could find the original owner’s phone number. ‘Some owners have a “backup phone” that they are using, but it has the same phone number,’ he explained on his YouTube page. He sent a text to a number belonging to Alyssa King, asking if she had lost a phone recently. The shells should be immersed in boiling water for two minutes. Immerse the egg in boiling water. Sandra immersed herself in work to try and forget her problems at home. She got some books out of the library and immersed herself in Jewish history and culture. We offer franchise businesses with a guaranteed minimum income. Is the CD player still under warranty? I’ve had problems with the car, but it’s still under warranty. You’re in luck. We’ve got one pair left in your size. A warning signal lit up on the dashboard. Dallas then filmed the next morning, when he received a call from Alyssa. ‘Yes, it is!’ Alyssa screams excitedly. Alyssa, who lives in Florida, then reveals that her she lost her phone more than two weeks ago while on vacation. ‘We should make a commercial for Apple, that’s pretty impressive for an iPhone X,’ Dallas replies. 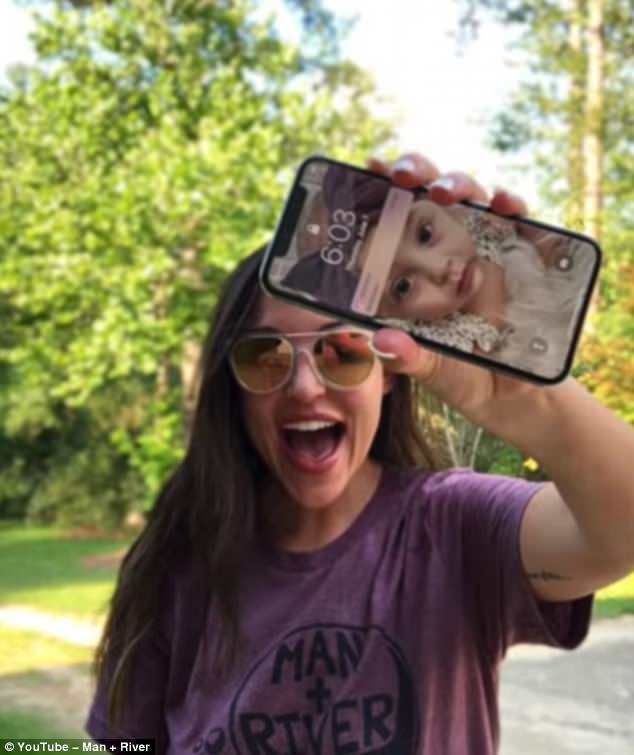 Alyssa then tells him that she is especially overjoyed with the news because the phone had photos from her newborn daughter’s first five months. She exclaimed in horror when she saw me. We’re overjoyed at your news. Helen was overjoyed to hear that they had given her the job. I’m overjoyed that you’re coming to visit me. When Alyssa offers to pay for shipping, Dallas assures her that everything will be taken care of. Dallas called Alyssa’s reaction the best he’s ever gotten since he began hunting for lost items. Make sure you back up your files. My world has been turned upside down by this disease. My father offered to take us to the airport. Things worked out pretty well in the end. I hope your new job works out. In fact the trip worked out cheaper than we’d expected. 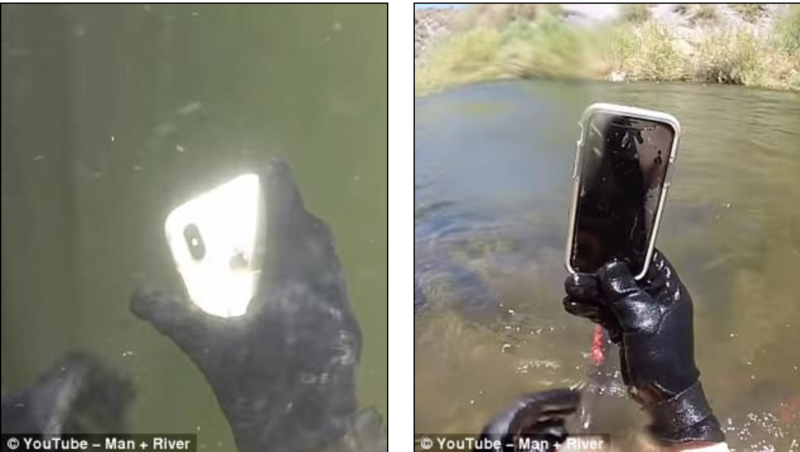 Dallas, a free diver and scuba diver, has since posted the video to his YouTube channel, where it has been viewed more than 512,000 times. 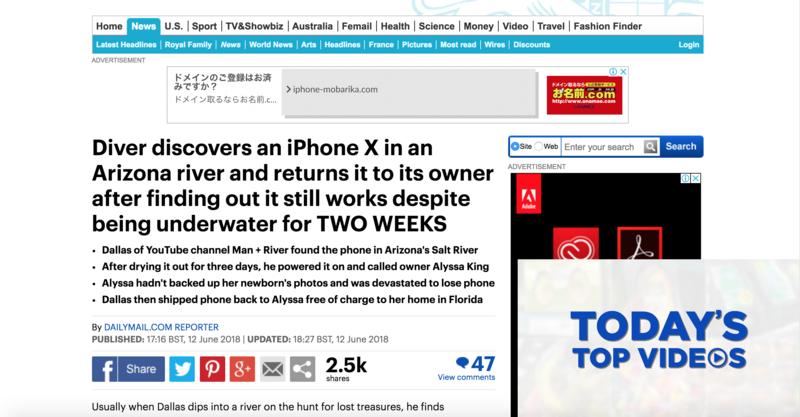 Alyssa also posted about the experience on her Facebook page, revealing she had lost the phone while tubing down the river with a friend she was visiting in Arizona. ‘It was an absolute blast and the scenery was like something out of a movie,’ Alyssa wrote. You should have come with us last night – we had a real blast! Thousands of new businesses have sprung up in the past couple of years. New Internet companies were springing up every day. The car seemed to come out of nowhere. She said her attacker seemed to come out of nowhere. The boat filled with water and began to sink. Alyssa said that while she doesn’t usually ‘let materialistic things bring me down‘, she was devastated when she realized the pictures on her phone weren’t backed up. So she was even more ‘stunned, astounded, and absolutely blown away’ when Dallas called her weeks later to reveal the good news. He was really brought down by the loss of his job. Why do you have to bring me down when I was feeling good about myself?